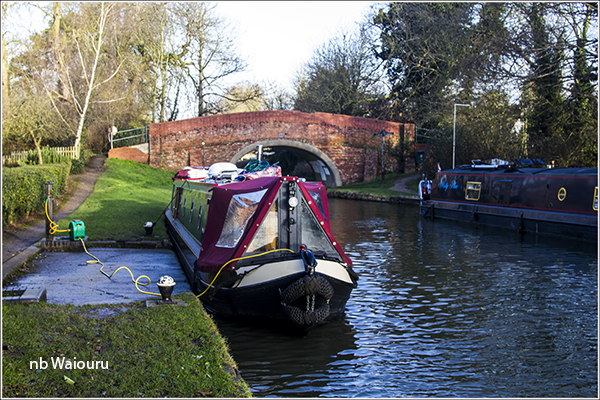 Having moved from Milton Keynes to the 14 days moorings just above Fenny Stratford Lock we discovered there was no signal on the phone. After fiddling doing some technical problem solving with the phone it was apparent we had lost the signal from Three. The other phones on the boat were successfully connecting to Vodafone and when we switched SIM cards all the phones worked on Vodafone. My theory is the 4G Samsung phone sometimes gets confused when it loses the 4G signal and then fails to automatically revert to 3G. This location also appears to have a weak 3G signal. The solution that worked was to do the following. Go back to the boat and ring the Three phone using a Vodafone handset (don’t answer the call). After doing all of this the phone now works and we are back to having internet coverage. We stopped at the water point adjacent to Milton Keynes Marina to top up the water tank. The tap is very slow which meant we didn’t depart until 50 minutes later. The new hose proved to be much better than the old. I’m so pleased we no longer appear to be getting kinks in the hose. Milton Keynes Marina appears to be well patronised. Although I did note a number of boats have gathered outside the marina entrance in close proximity to the water point (like bees to a flower). 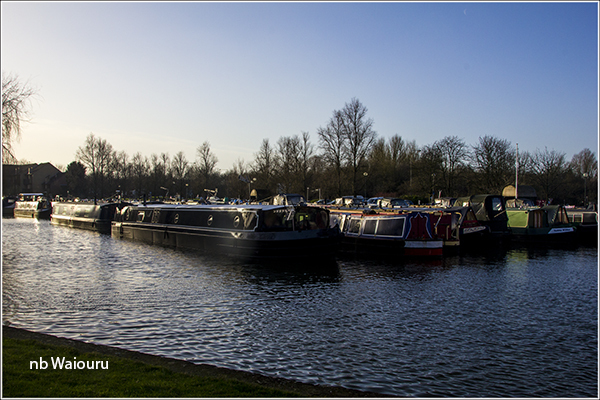 We passed some of these boats on our way into Milton Keynes four days ago. They have since passed us and winded. 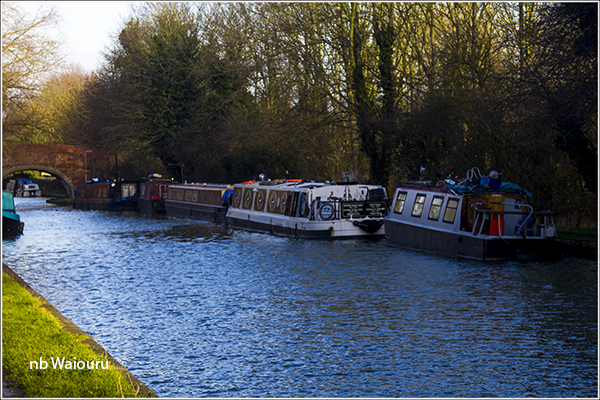 It appears they only cruise on a short stretch of the canal around Milton Keynes. As you will have noticed from the photos the sky in the morning was clear but the mercury was in low single figures. I was well wrapped up on the back and Jan stayed inside because she isn’t feeling the best. Actually it seemed rather pointless to have two of us on the stern attempting to stay warm. We’ve had a slight problem lighting the Refleks stove over the last couple of days. After thinking about it last night I decided it was probably caused by two issues. Too much diesel and the using a large piece of fire lighter. Today I set the stove on a much lower fuel setting and used only a quarter the size piece of fire lighter. This got the stove going on the first attempt. After mooring above Fenny Stratford lock I disposed of our rubbish and the “other” boaters rubbish bags full of nappies in the CRT facilities below the lock. There was already a boat moored on the services block where the boater was manually pumping out his toilet tank into a 20 litre container which he was then emptying down the elsan. It appeared his pump out hose wasn’t long enough to reach the elsan point. I can not say I’d enjoy pumping our 800 litre tank out into a 20 litre container and then carrying it to an elsan. That’s <let me think> 40 jerry can loads. No…. I’ll pay someone to empty it! There’s a large Tesco Extra supermarket reasonably close to our current mooring. I’ve already made one trip with the shopping trolley for the heavy items (12 litres of long life milk and 24 cans of soft drink). The next trip can be done with a daypack. they do a nice good value carvery in the pub next to MK marina. Not to far to walk back from Fenny if your there for a few days. Bletchley Park is interesting as someone else mentioned a while back. Good thing was your ticket lasts a year or at least it did when I went last. I checked out the pub on my Wednesday evening walk and again when stopped at the water point. I could probably make it back that far walking but Jan is another case. We're not young like you two! :-) There is a pub by the lock (Red Lion) and I'll have to check if it serves a Sunday roast. If not; I'll have to take Jan to the 'Golden Arches' for an ammonia washed rehydrated offal beef burger in a sesame seed bun. I hope to visit Bletchley Park tomorrow. We are slowly making our way towards you. So start hiding!